The criminal defense law firm of LeahLegal is dedicated to defending individuals who have been charged with or are under investigation for the commission of misdemeanor and felony crimes. We advocate for individuals of all ages, from all walks of life and at all stages of criminal proceedings. Our clients come from throughout the Southern California Counties of Los Angeles, Ventura, Orange, Riverside and San Bernardino. 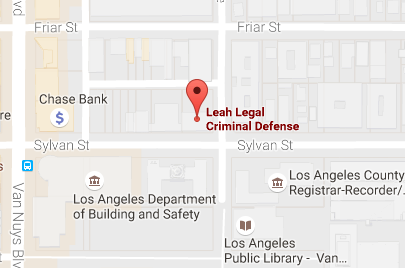 LeahLegal is result-oriented. We seek to help our clients achieve their objectives in the timeliest, most economically feasible and successful manner possible. Our philosophy emphasizes a fierce and uncompromising defense; we believe in meticulous preparation and we’re not afraid of hard work and long hours. Above all else, we make sure to find a defensible truth in every case. Our clients never lose sight of the fact that we care about them and their loved ones, as we remain compassionate and sensitive to each of their individual needs. At our law firm we maintain a small caseload. We feel that it is crucial to work closely and directly with our clients and to be easily accessible to them in order to assure high quality representation. Personalized attention helps to ease much of the frustration and fear that are an inevitable part of being caught up in the criminal justice system. Our clients remain informed of the legal process and developments in their case and they can expect honest communication at all times. In order to develop the strongest and most creative defense possible for any given criminal charges, LeahLegal works closely with a team of skilled and experienced attorneys who specialize in that particular area of criminal law. This means than more often than not our clients have the benefit of more than one legal mind working on their case without having to pay additional fees. To learn how we can help you with your felony or misdemeanor criminal charge, contact us online or call our office at (818) 484-1100 at any time – 24 hours a day, 7 days a week. We offer free initial consultations, accept cash, checks, and credit cards, and are available for weekend/evening appointments.